Quinoa, beetroot, mango, pomegranate and lean lamb steaks make up this rainbow of a dish, among many other delicious ingredients! 1 Place the quinoa into a pan and add around 300ml water, bring to the boil and simmer for 10 minutes. Remove the pan from the heat and allow to stand with a lid on for 5 minutes. 2 Heat the oil in a large wok or frying pan, add the lamb strips and brown over a high heat – this should take about 2-3 minutes. Add the soy and allow to bubble and reduce. Coat the lamb in the soy sauce and then remove from the heat. 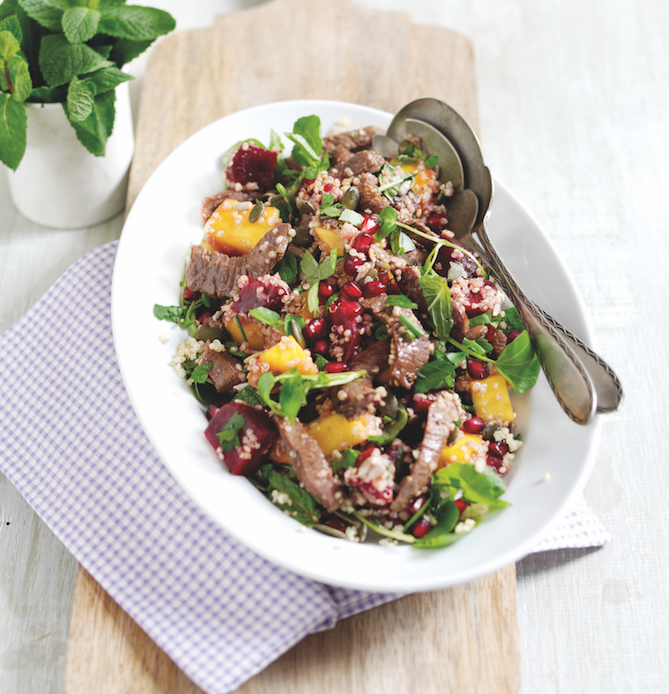 3 Place the lamb, quinoa, sunflower seeds, beetroot, mango, pomegranate, herbs and watercress into a large bowl. Toss to combine and serve straight away.